“With the Patriots headed to the Super Bowl, now is not the time to increase the beer tax.” Either the Governor strongly identifies with us commoners or there was going to be one heck of a Super Bowl party at the Hassan household. I hope our Governor’s positions on important fiscal issues are more considered than her sports predictions and I wonder how she feels about raising the gas tax in New Hampshire now that many Patriots fans are more likely than they were a couple of weeks ago to go driving to ski, shop, or hike next Sunday. No doubt revenues from NH’s gasoline tax and its road tolls are stagnant or declining. Higher gasoline prices have reduced discretionary driving and prompted greater fuel efficiency in our choice of automobiles and a steep recession further dampened gasoline consumption. No doubt there are a lot of transportation infrastructure needs that are clamoring for state revenues that are not likely to increase organically. 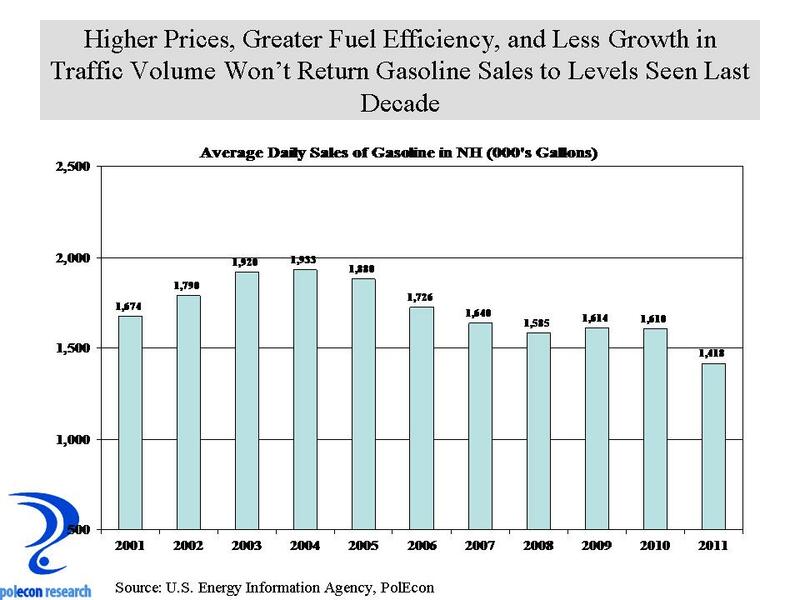 Gasoline sales (and the revenues derived from them) will not rebound to levels seen early in the past decade. Beside greater fuel efficiency, the volume of traffic at key border locations (I93, I95, Everett Tpk.) has declined by 7.4% between 2004 and 2011. Traffic volume at toll booths on these roads, however, declined by just 3.9% during the same time period (chart below). Of course the implications for gas tax and road toll revenues are significant, but those trends follow trends across the nation. 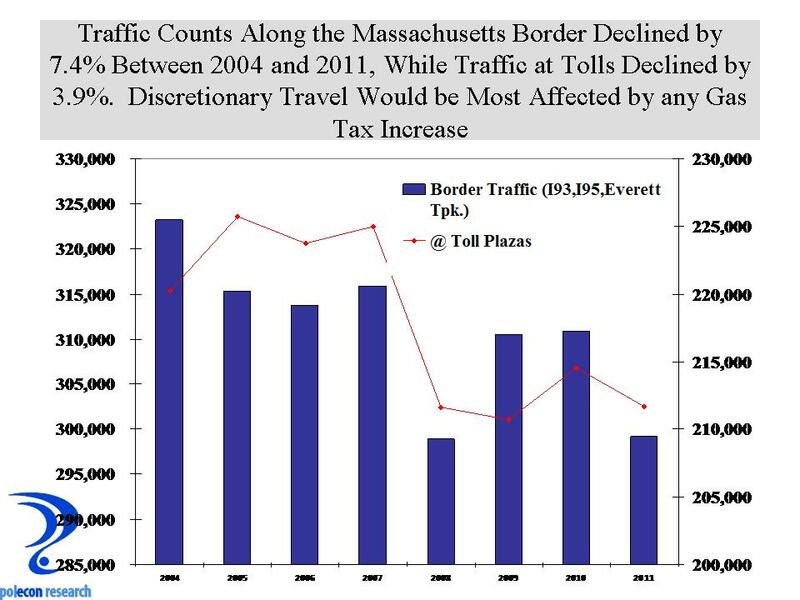 When I look at the data, the smaller decline in toll booth traffic than in overall border traffic suggests to me that commuting is being less affected than is more discretionary travel. That has even more profound implications for longer-term trends in NH’s general revenues because they depend so heavily on discretionary travel and discretionary spending. 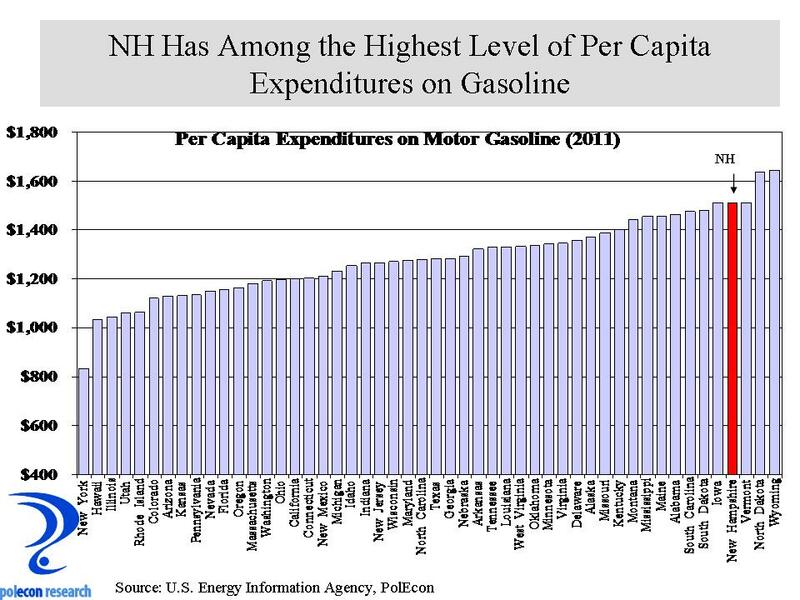 One measure of how important discretionary travel is to NH is the fact that the state ranks fourth in spending per capita on gasoline. Like beer or cigarettes, its not that we drink or smoke that much more than residents of other states, its that our numbers are increased by the high volume of visits the state receives. I appreciate that the implications of the gas tax in terms of infrastructure investments is an important discussion to have. I also think a discussion of the implications of a higher gas tax on the larger revenue issues facing the state ought to be evaluated. That evaluation needs to be more thoughtful than the typical arguments made by opponents of any excise tax increase (“if we raise the gas tax we will lose not only gasoline sales but a billion dollars in potato chip and chewing gum sales”). I don’t know whether the gas tax should be raised and I don’t know what the impact of an increase would be in a larger economic and revenue context but I do know that higher gasoline prices affect a number of revenues because I have analyzed that in the past. That isn’t reason enough to drop the idea of raising the gas tax, but it is reason enough to discuss it in a broader context than just the funding of infrastructure. Maybe I’ll get that chance when my invitation to the big Super Bowl party in Exeter arrives, I’m eagerly off to the mailbox now to look for it. This entry was posted on January 28, 2013 at 2:59 pm and is filed under Energy, Fiscal Policy, Gasoline, infrastructure, taxes. You can subscribe via RSS 2.0 feed to this post's comments. The gas tax debate is interesting. Assume road usage is flat, fuel sales are flat, the tax stays the same, but the costs of maintaining the infrastructure increases 2% annually. Sooner or later you find that the infrastructure cannot be adequately maintained if revenue is flat. A business cannot hold its pricing for long if costs continue to increase. Soon it will be operating at a loss. Should we look at the fuel tax as a user fee that must go up at least at the rate of inflation?